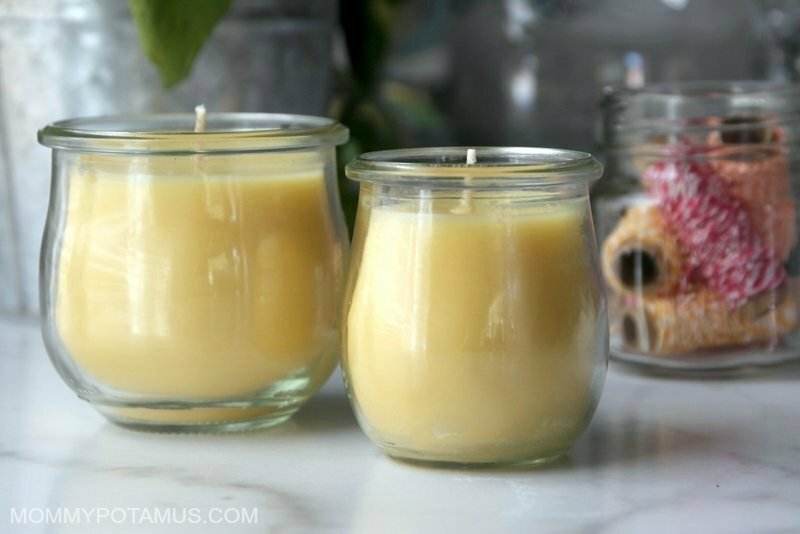 How To Make Beeswax Candles - Easy, Healthy and Affordable! 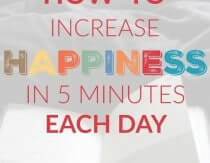 Heather Dessinger 233 Comments This post contains affiliate links. A golden glow and long burn time are just the beginning of a handmade beeswax candle’s charm. Unlike paraffin candles – which release carcinogens like toluene and benzene into the air– they burn clean and bright while releasing a faint honey scent. Even better, making beeswax candles at home – either as a gift or for yourself – is little more than a melt and pour process. In the tutorial below I’ll show you just how easy it is. Now, you may be wondering . . . Yes, you can, however beeswax does not hold on to scent as well as some other waxes. For that reason, I blend a little coconut oil into my candles to give the scent more staying power. Even with the addition of coconut oil, I’ve found that only very strong scents (peppermint, lemongrass, vetiver etc.) do well in beeswax candles. Fortunately, most beeswax smells faintly of honey, which is delightful all by itself or when blended with essential oils. This recipe will make two 12 ounce candles, three 8 ounce candles or six 4 ounce candles. 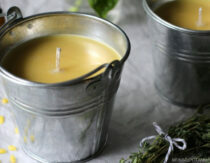 *Because beeswax candles are slow burning, they require thicker, sturdier wicks than what is used for paraffin candles. Keep in mind that the way a wick burns will vary based on many factors, including the size of the container and how refined the beeswax is. I’ve shared which wicks have worked for me using refined beeswax and the jars above, but it may take a little experimentation to find the perfect size for your wax/container combo. 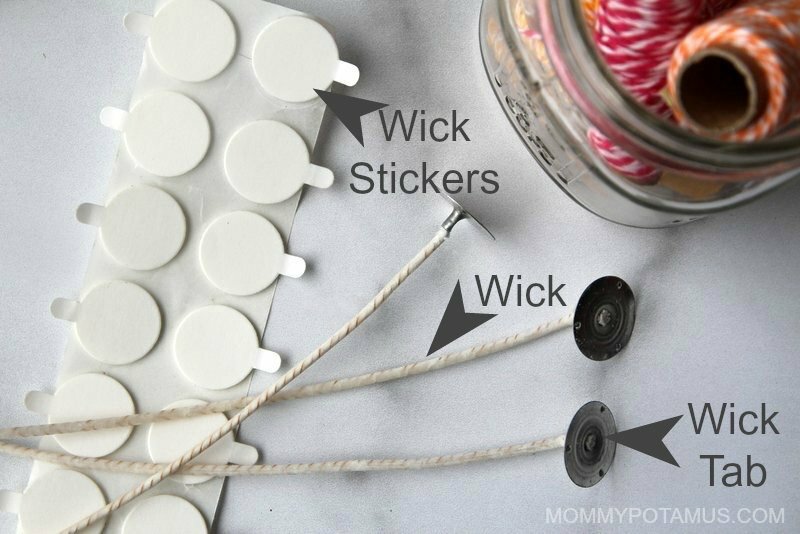 Pull one of the wick stickers off the roll and place it on the wick tab, then peel the paper off the exposed side of the wick sticker. Step 2: Attach the wick to the bottom center of the jar. Step 3: Melt wax and oil in a double boiler. 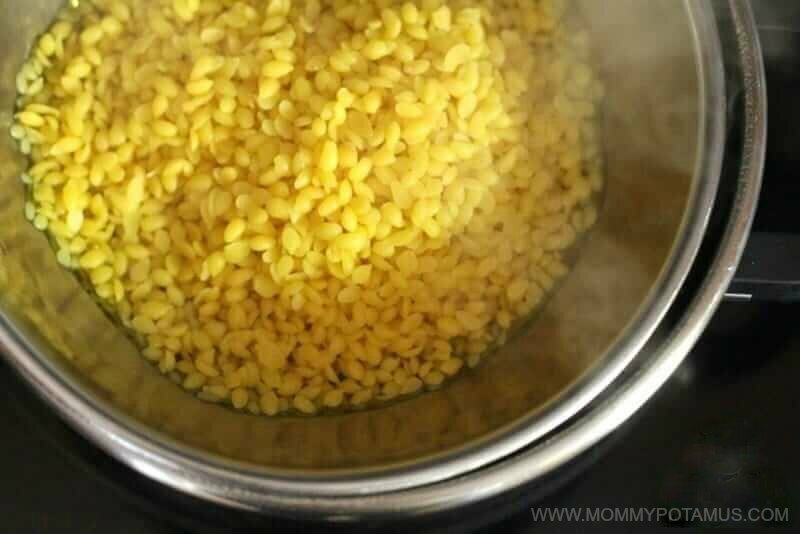 If you don’t have a double boiler, you can create one by placing one inch of water in a pot, placing a smaller pot or stainless steel bowl inside, and bringing the water to a low simmer. Step 4: When the beeswax is melted, add essential oils if desired. 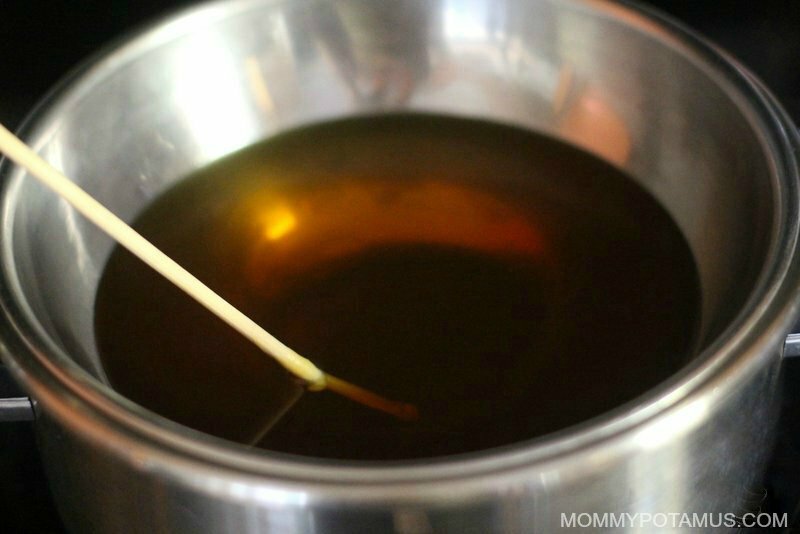 Stir the beeswax, coconut oil, and essential oils (if using) together. I use a wooden chop stick that I keep just for this purpose so I don’t have to clean it. Step 5: Pour wax into jars. Step 6: Set the wick so that it’s in the center. 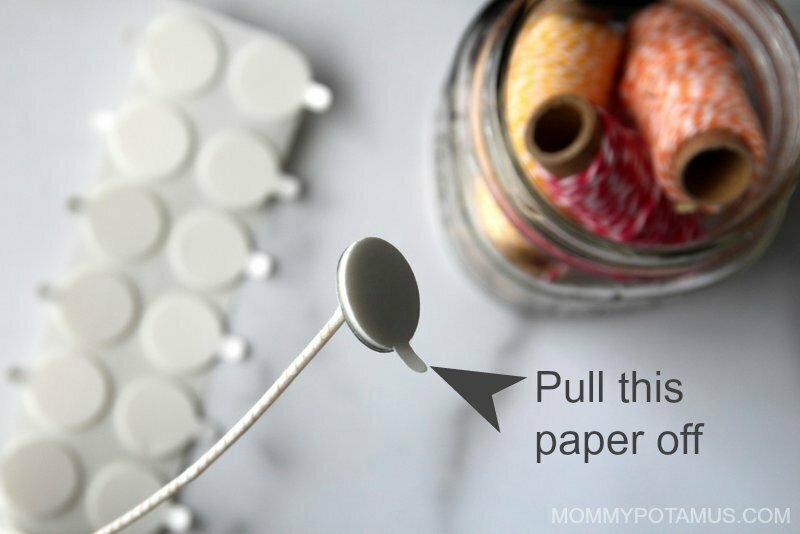 You can do this by placing a pencil across the jar and taping the wick to it, or use my favorite method, which is to thread the wick through the center of a clothespin. Step 7: Place the candles in a warm area to harden, because if they cool too quickly the wax will sometimes crack. I usually preheat my oven to 170F while I’m pouring the candles, then turn the oven off and place them inside. Allow to cure for two days, then trim the wick to about 1/4 inch. When lighting your candle, direct the flame at the base of the wick so that some of wax melts and is drawn up into the wick – this helps it burn properly. Allow candle to burn long enough so the wax melts out to the side of the jar. This helps to prevent tunneling (when the middle melts down with lots of wax left over around the edges). Never leave a candle unattended. What a great post! A friend of mine just moved into a motor home and is going to travel the country. He burns candles in there a lot and I was concerned about toxins being created in such a small and confined space. I think I will make him a bunch of these for Christmas. Thank you so much for sharing. THANK YOU for posting this!!! Just the last two weeks I’ve been researching candles and trying to figure out how to do beeswax– would you believe some of the major candle supply websites don’t sell beeswax?! And a lot of the books only teach fancy candles, not the basic pour into a container option that I was looking for. This is absolutely perfect! Up here in British Columbia, Canada we have beeswax in the Health Food Store.. It’s about $20.00 for a pound. I just bought a brick of pure Bees Was yesterday as I use in making my arthritis pain rub cream. You can buy bees wax much cheaper in Chilliwack. It ranges from 7-12$/ per pound depending on where you order. Try the bee farm on McGrath road . I am buying large quantities from them. The more you buy, the cheaper it gets. I buy beeswax from a local beekeeper who sells honey. He only charges $6 for a pound. It isn’t refined and has to be purified but it is worth it to me. All you have to do to get the particles out is boil it with some water and then let it harden in the pot overnight and scrape off the particles(repeat the process once or twice). It is more work but it’s worth it to me instead of paying a lot for beeswax. Amazon does not have the wicks you suggest, can you make another suggestion? Do you measue 1/2 cup of coconut oil befor its melted or after? Where you share where you actually purchased your supplies? Did you find things online or locally? Hi Heather! With the exception of the coconut oil I purchased everything locally. My neighbor is a beekeeper and although she didn’t have any wax to sell when I dropped by she was actually just getting rid of some wicks I could use. Another farmer supplied the wax and I found the jars at Hobby Lobby. Hope that helps! Heather, can you tell me how many candles that this makes? This is great but I bought 2 8 ounce bags of the beeswax pastilles and 3 8 ounce jars, it only filled up one and a quarter jars! The wicks I bought are lead free and as soon as I poured the melted wax into the jar the wick came right off of their base! Think it’s the wrong kind of wick? What can i use to color my candles? I am a beekeeper too and use only organic management in my apiary. Thanks for supporting beekeepers! Thank you for posting these instructions. 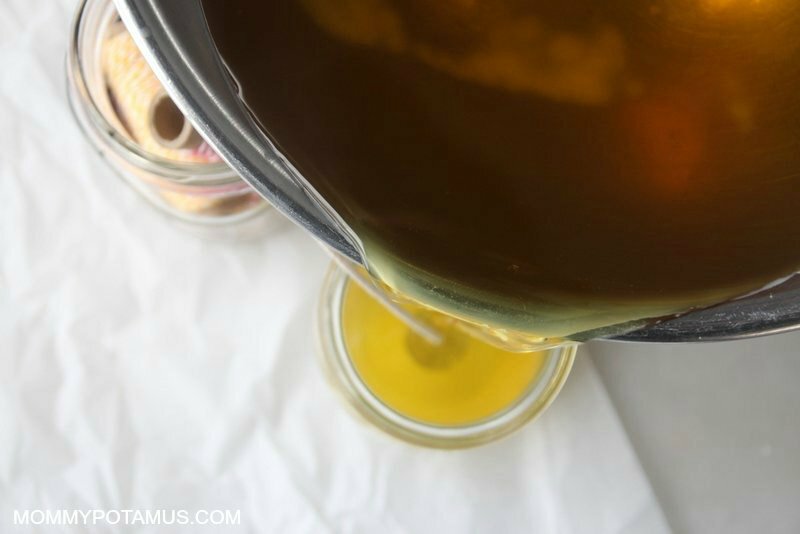 Have you ever added organic essential oils to the beeswax and how did it turn out? I am wondering about adding essential oils and/or scent oils to these beeswax candles. Heather, can it safely be done? Thanks!! Thanks for linking my article! This is such a great tutorial, and the step-by-step photographs are so helpful (not to mention beautiful and with perfect lighting!). That chart about the wick diameter is great–that is certainly key to having homemade candles work out. Love this!! Hi Lauren! Your post was what inspired me to try to make my own, so THANK YOU! P.S. I have tried to pin your article oh so many times and it never goes through. I can pin everything except that one article – argh! Beautiful! Did you source organic wax? Did the candles turn out okay using the coconut oil? I’m thinking about making these for Christmas gifts! Yes, they did! I recommend testing one or two before giving them away to make sure you have the wick size correct, but the coconut oil has not caused any problems for me. OK, that’s what I thought too, but just wanted a second opinion! Thank you and good luck on your certification! I agree…from what little I know. The oil fragrances however are a different thing entirely and I believe that’s something I want to stay away from. Just keep in mind that if you have pets, especially cats, many essential oils are toxic to them. Hi Lisa, I use essential oils in my beeswax candles too. In fact, I just finished a few today, and one is burning as I write this. I also purchase my wax from a local bee farmer which happens to be my boss 🙂 Give the oils a try, at least for variety. 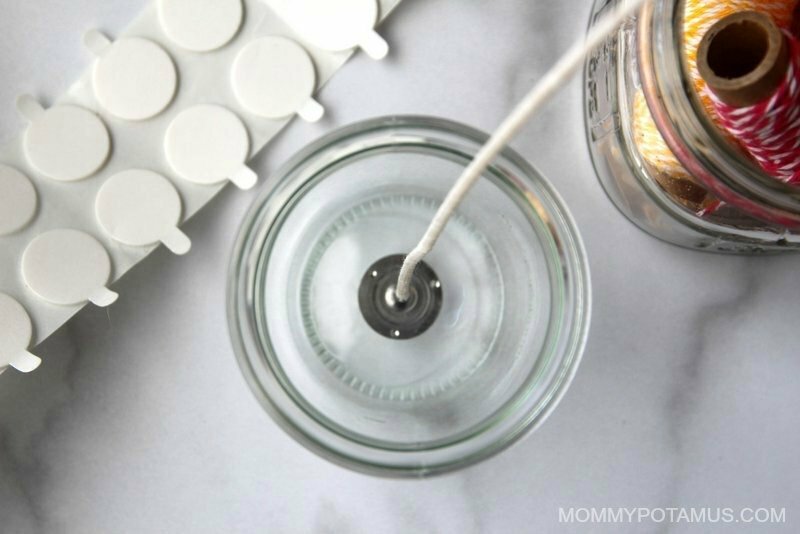 How many drops of oil do you use per size candle? I’m curious! I love how beeswax smells. Would tallow work instead of palm oil? I just rendered some for the first time ever and i get why it was used in the past for candles. It’s very wax like. Also for a more heat stable container and I had a box gathering dust in a closet. I’ve used the cute jelly canning jars for beeswax candles for gifts. They never cracked. Has that been true for anyone else? 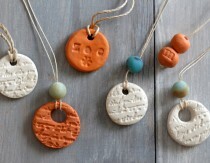 Where is the best place to find beeswax to make these?? Ha, no worries! Good luck! I need to make beeswax candles that will burn for three days how do i go about it. Hi Arthur, I’m sorry but I don’t know how to do that. Get a really big jar! And start experimenting! You can always re-melt the wax if it doesn’t work out. Try a tall, skinny one to save money on wax. Thank you, Heather! I’ve only recently learned that my love for a candle’s cozy flame was probably adding to my allergies! I was under the impression that beeswax candles might be too difficult to make, so I was thrilled with today’s tutorial! I can’t wait to try this! Thanks for this great How-To. We made these last year and I was happy though not ecstatic with the results. The oil seems to be the missing piece for us. It was difficult to find this info on line anywhere, so I’m excited to give this another try. I LOVE the smell of these candles. I found it funny that you posted this today as I made my first beeswax jar candles this past weekend! I found it really difficult to find anything online about making beeswax jar candles…if there’s even any info on making beeswax candles at all, they all assume you’re dipping to make tapers or rolling them. So, I’m very glad to have this as a resource now and I might use some of your suggestions for next time. The wick size chart is VERY helpful…I scoured so many candle-making sites to try to find that info, but couldn’t and in the end took a shot in the dark and bought some #5 to use as wicks in the pint Mason jars (about 2 1/2″ in diameter) I used as containers. But I noticed you didn’t even have #5 on your chart…is there a specific reason for that? I’m finally burning my candles tonight and it seems that the wick is burning too fast and then “drowning” somewhat in the wax…does that mean I need a bigger size? 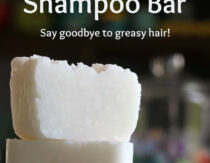 Do you know if “diluting” the beeswax with coconut oil would help with that issue some? Thanks so much for any info or ideas…I’m so excited that someone finally wrote a post/tutorial on this! Hello! I realize this convo thread is old, but I’m having the same problem as Jessica T above!! My local beeswax keeps pooling/ coning even in a perfectly straight jar!! Does using the little metal wick cup at the base help/ If the wick is even a little off center, can that create the pool? So far I’ve been just adhering the wick to the bottom w/wax, and miraculously it’s staying as I set it. And burning fairly straight. For a beginner it’s all pretty good but…! I don’t see the pooling /coning much w bought beeswax candles, tho I usually only use the beeswax votives. 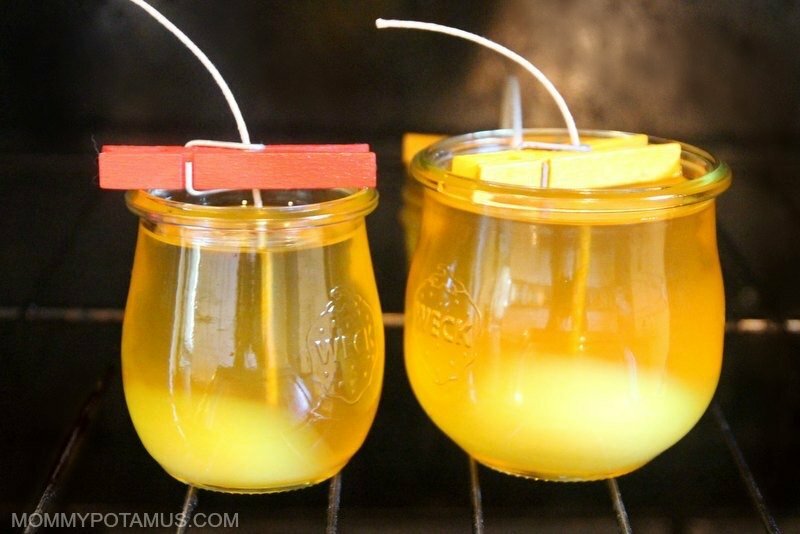 Maybe w bigger beeswax candles (like mine in a jelly jar) the pooling/coning is normal because of the hot n slow burn?! The pooling (Coning down the middle) is sometimes caused by not letting your candle burn long enough each time. Too many short burns will make it cone and pool. You want it to burn to the edge, so make sure the wick isn’t trimmed too short, and if you aren’t going to let a candle burn more than an hour, use a smaller candle to burn for the shorter time. If your candle has coned, cut the wax out down to where the wick is with a butter knife or such, and reuse it in your next candle making process, or use it in a warmer, Your candle will burn correctly if it burns enough to liquefy the whole top layer of the candle, not just the center. Wonderful post! You are AMAZING! How does beeswax compare to soy candles? I tend to avoid soy (for food) like the plague; but curious for air toxins? As with almost any “natural” substance you burn in your home, beeswax candles (and soy-based ones) will generate a certain amount of soot. Soot is, by its chemical structure, cancerous. Technically. But you’d have to inhale a lot of it to end up getting cancer! Regardless, inhaling a little soot is going to be thousands of times less damaging for you than inhaling burning petroleum products like plastic. If you are burning soy, I wouldn’t worry about this. So long as your home is not filling with smoke or an obvious unpleasant smell, the soot isn’t going to do you much harm because the volume will be so very small. Worry less! Heather, can you add fragrance? My friend gave one of these to me for Christmas and it is fantastic, I can’t wait to try this out on my own! Great tutorial. I LOVE beeswax candles. Did you have any trouble with the candles burning normally in the jar? I’ve heard beeswax is good for pillars but not in jars. Maybe I’m blind, but I can’t seem to find where you wrote the beeswax to coconut oil ratio. Is it 50/50? In the directions above it indicates 1 pound beeswax to 1/2 cup coconut oil, however here you say 1 1/2 pounds beeswax to 1 cup coconut oil. Which is it? Thank you so much for all the info!! My brother has bees & I asked him for wax when he came to visit this weekend, brought me 20 lbs because I told him I want to try making candles. He said he never could get them to burn properly but would love to see me make it work. However,he also didn’t have your candle wick chart. Sooooo….I’m going to try your recipe & I will let you know how it turns out!! Very exciting! question about the coconut oil… have you found any info on how clean coconut oil burns? I was curious about this and didn’t want to compromise the ‘clean’ burning beeswax candle. I haven’t tried it yet, just trying to do some research before I start this whole process. Also, I have been looking for a reliable source with the information about cleaning the air, do you know of one? thanks! Do you know of any safe fragrance? I am assuming the closest thing to 100% safe would be essential oils…is there nothing else we can use to create a nicely scented candle? I make my own lotion by infusing coconut oil with herbs. 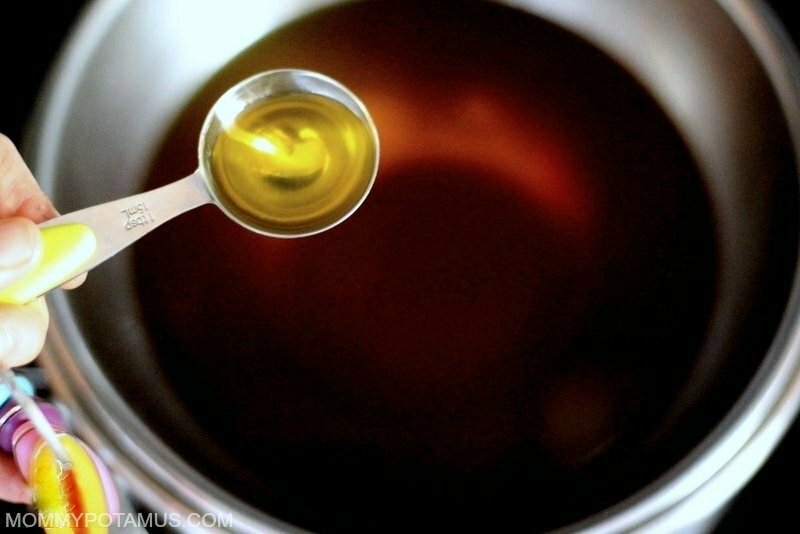 I just simmer a half cup of coconut oil with a few tablespoons of dried lavender (or a vanilla bean, sliced in quarters lengthwise, then chopped into small pieces) over a double boiler for 3-4 hours. Strain mixture through a coffee filter. I would think this would make a lovely non-toxic candle fragrance! Thanks for the info on beeswax and coconut oil! I want to make some soon. I love scented candles, but don’t like artificial fragrance. 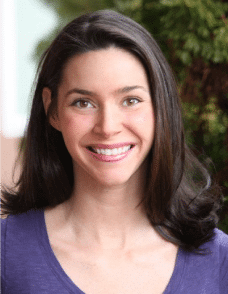 Thanks, Laura, for your suggestion to infuse the coconut oil with herbs. Perfect! Can’t wait to try it! What size was your wick? (palm oil is not sustainably produced and is often the cause of driving out natural habitats in the rain forests as many are cleared out/levelled for the production of palm oil)! Thanks again! Using essential oils to scent candles shouldn’t be a problem according to a friend of mine who is a clinical aromatherapist. The important thing to remember is to use therapeutic grade oils and not anything labelled ‘fragrance’. Aura Cacia is a popular brand and is generally safe to use, though there are better brands with stricter quality control. I’ve got wax piling up! I’m a natural beekeeper among other things. Thank you for the wick sizes. This is going to be very helpful for me. I like the idea of the coconut oil too. I live in Hawaii so it’s always warm so I’m going to experiment with different amounts of coconut oil. I may try less coconut oil and canning jars. Aloha! A wonderful fall project. Thanks so much for all the great ideas!! Thank you for this post! Love it. I am really interested in using fragrances that grow wild here. Is boiling them in coconut oil the best way? Or any other suggestions? Can you put them in raw to give the candle some decoration or will they catch fire? Just wondering if I could use a wooden wick with this. I am a beekeeper in Pittsburgh Pennsylvania. I got into beekeeping because I am asthmatic, and I’m not a good medicine taker (you know you forget when you start feeling better). Any how, I have a bunch of beeswax, at tree filtered, and wanted to do odometer natural things with it. Let me tell you for little critters they sure are amazing! Anyhow, my daughter made lip balm/Chapstick and weds till have loads of wax. I love the smell of the hive. In fact I’d love to be able to make air fresheners for the cars, it’s such a wonderful smell. However I am going to try your recipe for natural candles. Candles are beautiful, and I’d love to have them forte heir natural ascetics and their wonderful smell. Thank you for posting! I’ve been falling in love with your site recently. So happy I came across it! Where do you buy your beeswax? I love the honey scent from beeswax candles! How inspiring! Can’t wait to make some. Cheers from Spain! I am having the hardest time finding wick to make these. Where did you get yours? Looking forward to making some warm sunlight for this dark winter! Hi Sarah! I actually bought mine at a garage sale, which is what inspired me to make use of them. Sorry I can’t be more helpful! I tried making a beeswax candle in a small mason jar. I let it cool as slowly as possible. Ended up with a large crack through the center. Where did I go wrong? Hi Judith, I’m not sure unfortunately. I know it can happen with 100% beeswax candles when they are burned (which is why I add a little coconut oil), but I’ve never heard of it happening while they cool. do you need a special thermometer? i love the jars you have. any recs on finding them online? You said you used 12 oz. jars. They look small. 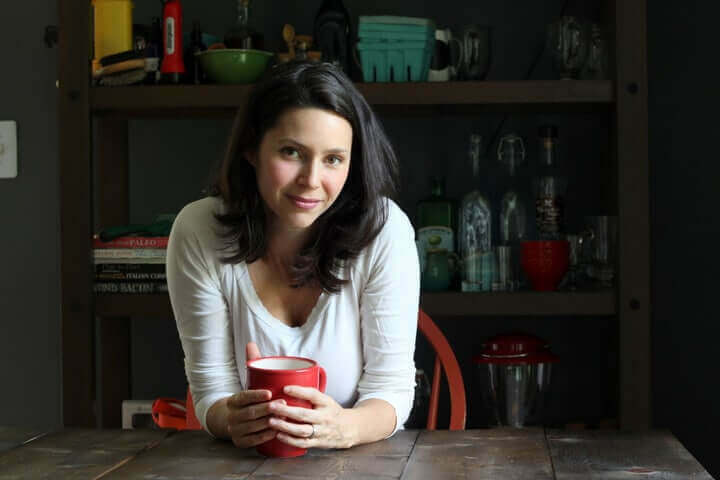 What size mason jar can i use for your recipe? Loveee these!! Cant wait to try! However, when would I add concentrated fragrance/oil if I was to add some to mine? I would add them to the wax-oil after it melts in the double boiler. I was going to ask if you had actually bought the hansi beeswax that you linked to on Amazon but see in the comments that you got it locally. I, unfortunately bought mine from Amazon and it smells absolutely awful. I’ve already melted most of it so I don’t know if I’ll be able to get a refund or not but I will definitely be headed to a local place where I’ve seen it available to try that. The smell is hard to describe. Musty, stale, sort of a lighter version of my sons’ ice hockey bags…horrible. A reviewer had the same experience with the brand. Just a heads up for your readers. They have said I can just send back the unused portion for a full refund. This may be a silly question but are there any tips for clean up? I used some of my regular pans to make these (which is hopefully ok with the wax?) and have gotten them pretty clean and will scrub again, but I was just curious if I was missing anything. Hi, Can you please tell me what size wick you used for these 12 oz candles? I don’t see it mentioned anywhere. I bought a votive mold…. and I also cleaned out all of my old candle jars (larger Yankee candle jars)… but I think those are too too big… and I want the flame to be more open.. I would think that is more beneficial???…. and I found four 12 oz jars like yours… so I just need my wick now 😉 Thanks. Hi Angela, I honestly don’t remember. I did include a guide in the post that you may find helpful, though. I’ve been googling and reading directions to try to figure out how to clean up the bowl that the wax is melted in. Does it clean up easily with soap and water if done when still melted? I just keep thinking of the jar candles when the candle is all burned away, and how impossible they are to clean. I think if you put the bowl in the oven at the lowest temperature your oven will do, then turn it off and leave the bowl in there until it’s just cool enough to handle safely, you can then wipe out the majority of the wax with paper towels. 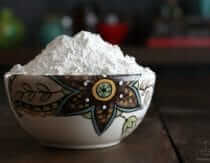 I make my own laundry detergent with castille soap, washing soda, baking soda and borax and I find a bit of this is very helpful in cleaning up DIY messes, including the beeswax dishes. Good luck! Another recipe I loved! I made these for Christmas gifts. I bought local beeswax and followed your directions – worked like a charm! I used small mason jars and made about 12 small candles. Any recommendations for easy cleanup? I used hot water to scrub wax off the materials I used, but I am concerned for the pipes and drains in my house. In the future, I want to be careful to not have wax remnats go down my drain. Please let me know if you have any ideas. Thanks. I’ve recently delved into the world of making my own skin care products and candles. I just made some regular soy candles and some massage soy candles which I really enjoyed. I do like the thought of using beeswax though because that is something I can get locally. Gotta loves supporting our local farmers! Thanks for the recipe. Please do not use palm oil. It is largely unsustainable & the palm oil industry is threatening the survival of the remaining two species of orangutans (Sumatran and Borenoan). Visit redapes.org for more information as well as alternative oil sources. Thanks! Hi – I tried out this recipe pretty much exactly as described – I used coconut oil – but I got a lot of tunneling with my candles – also, after lighting both candles that I made- they both split down the middle right where the wicks are. Also any thoughts/experience about the splitting would be really helpful! Thanks! I had the exact same problem as LIA. Mine will burn for about 15 min, tunneling straight down and after that go out and will barely light again and just fizzle out. I used cotton wicks. I now have 2 dozen jars of pretty looking beeswax decorations. I made mine in batches of just one because I read that wick size is so important to get right. Tunneling is usually caused by a wick that is too small, I believe. And I found the problem with online tutorials to be that none listed the wick size that worked best for their project. I made some in jelly jars with a 6/0 wick and they tunneled. The burned a circumference about the size of a votive. But I will reuse the wax. Don’t throw them all away!! I am going to try a larger wick, probably a #2. This site gives a size approximation. Have you tried with the #2 wick? Did it work better? Thanks!! 23bees has excellent hemp for making wicks! Can someone tell me where I can buy a candle melting pot? I’d rather use that instead of a double boiler. Also, where do you buy the lead free wicks? That’s great. I have your link for the organic beeswax and the wicks. I can always buy a double boiler at Bed Bath and Beyond or Target instead of a melting pot, do you think? Because the melting pot still has to rest on top of another pot with boiled water, right? Thanks! Jen, sure if that works for you. I love your site, and I love this tutorial! I wasn’t sure if there were any other healthy alternatives to cotton wicks? Cotton is a major GMO crop, and I would think there would be pesticides in the fibers. When burning, I wonder if they are released into the air? My son has asthma, so I want to burn the cleanest candles possible. Sadly I could find no organic cotton wicks online. Nice to know that. Thank you! I am a beekeeper that has never attempted to make candles until now. Years of beeswax building up! Find a local beekeeper to buy beeswax! The retail stores are high in price. I used 3 pounds of beeswax and 2 cups of coconut oil and made 3 candles in large mouth jars I kept from previously purchased candles. Not much? I bought the coconut oil at Earth Fare. Next time I will buy in bulk from Amazon. Use the larger size wicks for a larger candles. The packages will talk about diameters. Did your candles tunnel down the middle or burn evenly? For Beeswax tapers…I would recommend using the Square Braided #5/0 wicking..
l’m looking to buy some cotton wick. l would like to make candles since l have lotts of bees wax to use up. l’m very confused on the wick size to choose from. l’m using 12 oz mason jars wide mouth and 12 oz jars they look like your jars . Do l measure from the inside or outside for the wick size? What size wick would l buy… #6 cotton square ? Please help! Soo I planned on doing beeswax tarts.. but I haven’T seen it mentioned here anywhere is it ok to make tarts and will they burn well in the warmers ?? I am wondering the same thing. Did you ever find out? Brilliant instructions – can’t wait to experiment. Why do you use parchment paper when filtering the wax? Hi, I have a mostly unused jar of Murray’s beeswax & I was wondering if that was okay to use to make a candle. Hi there! Thanks for the great post. Any idea what would happen if I used unfiltered beeswax? I have my own beehive and recently harvested, so I have plenty of beeswax, but it hasn’t been strained and filtered. I actually like the “look” of a few imperfections, so don’t mind that, but would the residual honey and other imperfections make it burn with an odd smell? Since the beeswax pulls out toxins from the air I was wondering if I burned candles with scents next to your candles would it draw the toxins out of the air? Just a thought, and if I made my own what essential oils would you recommend? I was wondering, did you use wick pins in your jars? I didn’t see that you did but I was wondering how you secured the wicks in the jars? Looking forward to making these! Thank you! Hi Heather! 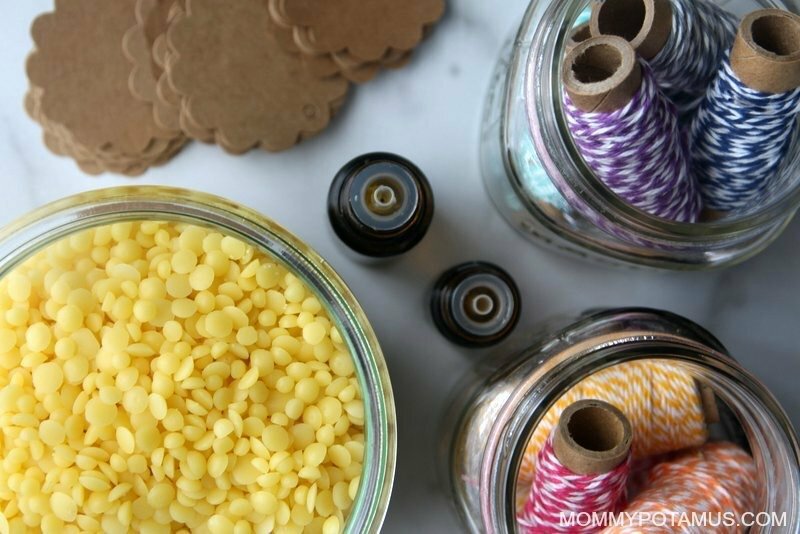 I stumbled upon your tutorial and I’m super excited to make a bunch of beeswax candles as gifts this Christmas! does raw cotton wick need to be treated before using in a candle? also, my hubby thinks the raw/hard/unused beeswax smells atrocious, so before i start my melting i wanna find a way to ensure the burning smells better or find a way to ease the smell or add scents into the wax, etc…any ideas? aren’t there any other containers that you can use that won’t crack from the higher heat? If you have heat resistant containers, can you use the beeswax by itself? What else can you use in place of coconut oil? coconut oil is pretty pricey. Is there any Organic cotton wicks out there? Or any other material that is natural that you could use as an alternative? Hi do you know if you can use wood wicks? And you mention the temperture, if you don’t put coconut oil in it, is the cup or jar really hot to touch, would it leave a mark on a table? My wife is starting a candle business. We are using 100% Beeswax and pouring in a glass. We have experienced a lot of what everybody described above regarding wicks. However, nobody has commented on cracking. We are having a terrible time with our candles cracking or pulling away from the outer edges and so far haven’t found a solution. We have an industrial wax melter and thought that a constant temperature would do the trick (was using a crock pot). Does anybody have any specific instructions? We have tried different temps, cold and hot environments, heating the glass, putting them in water, heat lamps, double pouring etc. Can it really be this difficult? Just a quick comment. I read that cracking can occur because of your temperature outside of pouring. That you are supposed to keep your outside at 72 degrees for pouring and cooling. Just a thought. Good luck. I am experiencing the same issue with shrinkage of the wax once cooled in the container. I can even pull the pot dried wax out by the wick. I haven’t lit the candles yet so I’m not sure if it’ll crack. Any ideas? Please advise. Thx. Your candles look so lovely. I think in my mind I had always confused beeswax and honeycomb candles thinking that they were one and the same. Thank you so much for also explaining how to filter the wax. I would have skipped that step. what is beeswax?? what’s mean that?? its mean honey or candle wick?? is this coconut trick just for container candles or is it also needed for tea lights, votive and pillars? I would not use it for pillars, as it might make them too soft. Hello. I am trying to make these candles. I found the same jars you used, Heather, at Hobby Lobby. My diameter measurement shows me that I should use a #8 wick (3.5″ diameter at the widest part of that jar), but your wick looks considerably smaller for the same diameter. My wick looks very big for that size of jar. Can you tell me what size you used? Great article! After reading your article and looking through the pics, i was wondering if instead of having to hold the wick down to get it to anchor and remain straight, if you have tried to soak the wick in beeswax first, let it harden (speed this up by putting it into the frig for a few minutes), now the wicks are stiff and straight and now just hold it in place as you pour the melted honey in the jar. What are your thoughts? Hi. These looks like fun gifts! I am wondering where everyone has found their cotton wicks? Do you know the burn time of these candles? Hi Leen, I found that adding coconut oil helped to prevent the candle from cracking. Hello Healther, nice article you have here! Did you try tapping the holder or whatever your filling with wax gently on a hard surface a few times throught filling? I found that the candles i made in highschool were very airy because i disnt do that to some and gdntle tapping fixed the bubble issue. Those candles were parafin candles however so im not sure if vees wax works the same way. This was the most helpful wick info I’ve found anywhere online — thank you!!! Can I ask, where did you buy your wicks??? Thanks in advance. Hello! I LOVE this method! Seems the easiest and definitely the healthiest! However, do you think I could add some flowers to it? Like lavender, or daisies…? I thought I could crunch them and add them to the mixture, so that the candle would have a light scent of the flower I added, as well as the chunks, making it less monotonous. Do you think there could be any negative sides? If you don’t know, I’ll try anyway and let you know if it went well or not!! Thank you for taking your time to read the comments. Did you try it?? I was wondering the same thing. I want to put leaves from my rosemary plant in there to give it a Christmas-y scent and better look….. BAM homemade presents! Thanks for posting this! And great idea with the flowers/rosemary. Sage would be good too. I usually burn it as an incense anyway. My only comment is my wax took forever to melt! I was seriously pouring candles at 2 am because I did not want it to go to waste, lol. Try cutting the beeswax into smaller pieces, even grating it, beforehand. Be careful when you do it as it is a bit slippery to handle. I inherited lots of #2 wicking but need #4 for the candles I want to make. Is it possible to braid/twist the #2 together to effectively create #4 (square) wicks? This was my first attempt at candle making. I made some mistakes and a mess. But I agree with other people commenting, where do you find nice thick, square wicks? This is not my 1st time making beeswax candles, but I used cotton wicks this time and they won’t stay lit. Any insight? Where do you buy the wax ? Funny, I just texted my friend the same question. I’ve heard that, too! And I always wonder how they can be sure it’s organic. I think if you know the land around your bees, then you can be sure. If your neighbor has pesticide fields, then not. I saw lots of wicks at Michael’s craft store but they seem very expensive. If you search for #4 cotton wick on Amazon you get lots of results though. I love this candle idea! Is there somewhere online that sells nontoxic wicks of the various sizes? Please send me the beeswax candles hoe to make them. Dude, the instructions are right here on the page. Scroll up. Why do some bees wax candles smell more like honey? Why do some wicks blow out very smoky and some blow out clean? Lovely, informative page! Thank you for publishing this as there seems to be soooo much misinformation out there for people to sort through. I do have a question you might be able to answer. Let me start by saying I wanted to start making candles because we have several bee hives and have been harvesting honey for a few years. As a result we have gathered several large buckets full of wax and cappings that I wanted to use. I bought a votive kit from a beekeepers supply catalog and was very disappointed that the wicks obviously weren’t the right size and wouldn’t stay lit. So, I started from scratch looking into better methods to clean the wax. This last batch: I melted the wax in water and let the impurities settle out twice (scrapping of the stuff on the bottom of the brick when it cooled), then I melted the wax and ran it through a piece of T-shirt fabric. I have worked my way up to a #2 wick. I’m burning one of the candles now. It started out with a lot of spitting for about 15 minutes; there are specks of wax all over the votive container. It’s been burning for about an hour I have a nice bright flame but it is still occasionally spitting. I’ve read dozens of webpages, watched hours of videos online but I’m obviously still doing something wrong. Any insight into what I’m doing wrong? This was supposed to be an easy project but it is becoming super frustrating. I read somewhere that if you have any pollen still in the wax, it will spit and crackle.. I also have to agree with Pete above..
Where do you purchase your wicks from? Is there any way to make them scented? I think it would be ok to use essential oils. In this post she wrote about not using essential oils because burning them changes the molecular structure, but the thing is, while the essential oils may be heating up a bit, they are definitely not burning. The only thing burning is the wick, which is above the oils. Lots of articles about making your own candles suggest using essential oils, so I think it would be fine. Anyone have thoughts on this? I urge you to think again as to what is burning , i think you find it is the wax drawn up into the wick where it is able to get air to fuel the flame and the wax IS the fuel the wick is the fireplace so to speak. Can those wooden crackle wicks be used with bees wax? Could i make beeswax tea candles in cleaned out aluminum cups from the regular petroleum tea candles? Or would bees wax get too hot for the aluminum? I don’t really use candles, only tea candles for my essential oil diffusers and little fairy houses to light up. Apparently burning bees wax produces negative ions that are released into the air, and apparently, most particles suspended in the air has a positive charge, so simply put, when they meet, they attract, combine, get heavy, and fall down.. That’s basically what I’ve found out by googling at least.. 🙂 Sounds reasonable.. Unfortunately, I haven’t been able to pinpoint a source to this claim.. It seems everyone is accepting it as fact, but the only mention I’ve seen of any reports on the matter is a japanese report that is not available in digital format.. So if anyone finds a source for this claim, please post here and preferably on wikipedia..
thank you for the great tutorial. i just made my first candle 🙂 i didn’t filter the beeswax, do i need to do that? also i did add essential oils but i don’t smell it at all when i lit the candle, any thoughts? 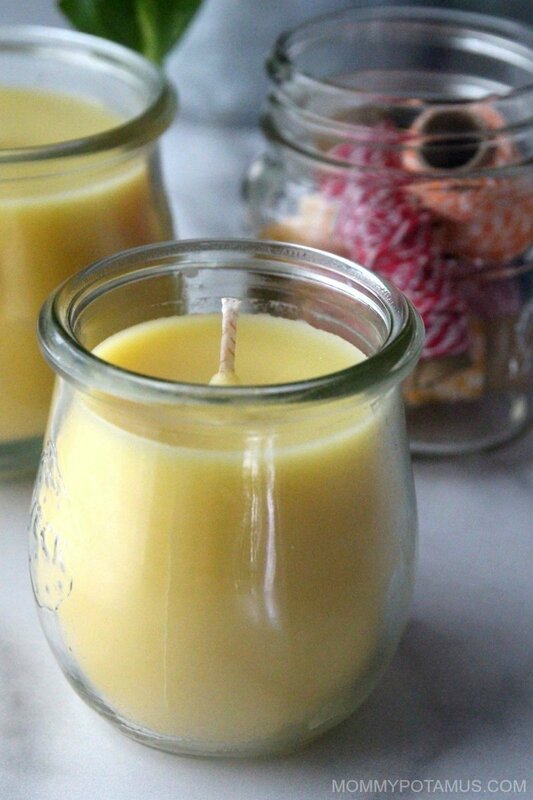 Have you tried beeswax candles using a wood wick? I see this article is a few years old but I can’t wait to make these! I do want to make mine scented though. I’m considering using essential oils. But I’m wondering if it would work to simmer cinnamon, vanilla, clove, orange peel, etc in the wax/oil to scent it instead. Does anyone know is that would work? Or if it would affect how it burns? When I have made candles in the past, I have never filtered the beeswax before. However, I don’t think that it would be too much of an issue to get an old pillow case and do it, though. Yet, why exactly should you filter out the wax when making candles? I love this tutorial. It doesn’t look very hard and I love how you can customize it. I’ve only recently learned of the downside to the typical candles you buy from the store, so I’ll be giving your beeswax candles a try very soon. We don’t need any more toxins in our house! Hey there, unfortunately the Ultimate Bundles team creates an agreement with each contributing author that only allows them to sell their resources for very specific dates. In order to extend the sale they’d have to go back and get new releases from all the authors. I SO wish I had a different answer for you! Are the wick stickers pretty necessary or just more helpful in holding the wick in place? Also, I have a few large chunks of beeswax from A local source. Do you have any suggestions on a faster, easier way to melt that down rather than having to use beeswax pellets? I noticed you add coconut to the beeswax, would this create not-so friendly(toxic) fumes when burning like paraffin candles? Great post. I would like to start making my own candles, but I don’t really want to add all those fragrances which can be found in so many of the commercially produced candles. Making a Beeswax candle looks like a great alternative. I would think you might have to filter it. There are some videos on YouTube on how to filter. From what I have read most people have used essential oils. I have also read from other sites that if you over heat 170F you could burn the wax. I’m a great lover of scented candles, but aftwe reading about soy being mixed with parrafin, I do not want to buy them anymore. So has anyone successfully used fragrance oils with success?? As I plan too do some experiments with fragrance oils in with the beeswax. Suggestion: Many questions and answers are repeated. As there are so many, would it be possible to cluster (those that can be) them by topics? If possible, I think that it would be win-win. Can I add actual honey to the beeswax candles? I made my first set of candles but they don’t really have a scent. The honey will seperate from the wax as the candle cools. It will not stay mixed in the wax. Thank you so much for this blog – it’s wonderful!! I melted by comb, strained it using pantyhose, let it cool and it separated from the honey. But my beeswax seems to not burn as well as store bought beeswax. Store bought is very yellow, mine is more a of a darker yellow/brown. For instance the store bought wax burns great in a 2 inch votive with a number 3 wick, but even using a number 6 wick, my wax makes a small melt pool and flame goes out. I suspect I am not melting and straining correctly. Help? IN order to make a vanilla scent, would one use vanilla extract or oil? Is white beeswax alright to use? I am starting doing bees wax candle, it looks great. but when using tin and not jars, it seems the wax shrink and the candle moves inside the tin. Any suggestion? Hi Heather! When I made beeswax candles, they burned too fast and created a big crater in the middle, without melting the sides. How do you prevent that? Much as I love so much of what you share, I was deeply saddened to read that you promote beeswax candles. Beeswax is made by the bees to create their home, their brood cells, and the storehouse for their food and the food for the baby bees. It is secreted from glands in their bodies when temperatures allow. Harvesting beeswax means the bees have to make more and more wax, causing stress and weakening of the hive. Beeswax is an incredibly complex substance that is vital to the health of the colony. It contains over 300 compounds and resonates at the same frequency as the vibrations of the bees’ communication, allowing them to ‘talk’ in the darkness of the hive. It has a multitude of benefits that we know only a fraction of. Hmmm, I wonder if clothepins have some variation in sizing, because mine fit. Bummer! 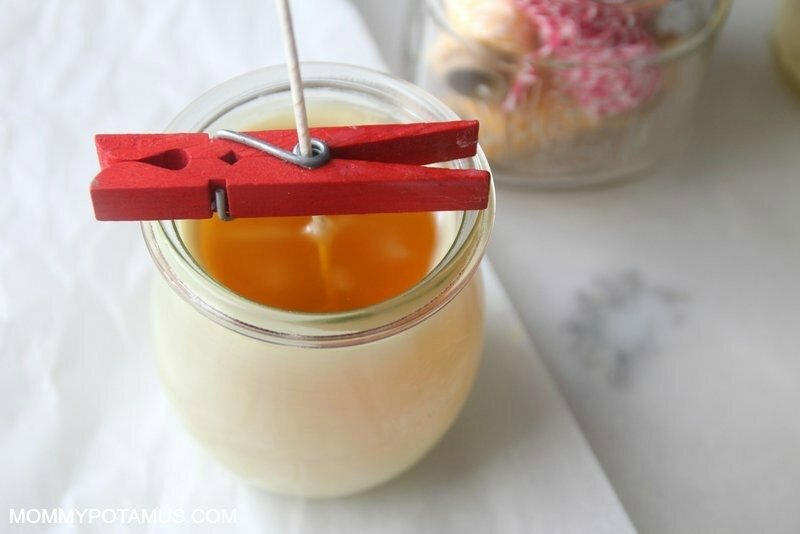 The good news is you can set the wick by placing two clothespins (or pencils) on either side of the wick to hold it in place. Something to think about, I recently watched an interview with Dr. Mercola and he was saying that low heat oils such as Coconut oil off-gas Formaldehyde when burned too hot. I’ve read elsewhere that Beeswax burns very hot but I don’t know how that compares to a stove top. It may be something worth considering though since most people are trying to avoid the toxins in regular candles by making these. Here’s to hoping this thread is still being monitored! I am unable to find the wick size chart everyone is referring to. Could you reply with that information? Heather, Thanks for this well written and informative post. So many people dont realize how easy beeswax is to work with. I enjoy my beeswax candles – even when they are not burning. The natural wax gives off such a sweet clean fragrance. Thanks a lot for this recipe! Is it possible to use candelilla wax instead of beeswax? Had you tried it? And what how much do you have to use ?….Thank you! I haven’t tried it. Candelilla is harder than beeswax so you may want to mix more coconut oil in if you decide to give it a go. Oh! thank you for your soon answer! I´ll give it a try and let you know how it goes! Have a great day! Thank you for this amazing post! I’m so excited to make my own candles-thanks to you!! !